Last Thursday morning on MSNBC, Sen. Claire McCaskill tore into presidential candidate Sen. Bernie Sanders, calling him "too extreme" to be the Democratic nominee. "He would like to see Medicare for all in this country," McCaskill said, adding that Sanders "would like to see expansion of entitlement." She further argued that Sanders is "not worried about debt at all. He is somebody who is, I think, frankly, against trade." Wait a second. Every single policy McCaskill took a jab at -- Medicare for All, Social Security expansion and opposition to bad trade deals like the Trans-Pacific Partnership -- is a strong, solidly progressive position. In fact, over the past months and years hundreds of thousands of DFA members have taken action in favor of each and every one of these proposals. They're key battlefronts in our war against income inequality. Claire McCaskill needs to understand that there is nothing "extreme" about wanting an economy that works for everyone. Every single Democratic candidate running in 2016 should support policies that will protect our workers and retirees and make our health care system more affordable. That isn't crazy. It should be common sense. 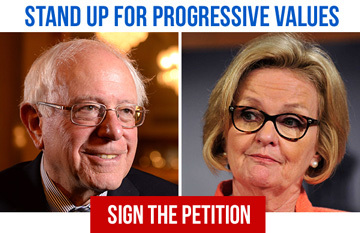 Sign Democracy for America's petition to tell Claire McCaskill and all Democratic candidates in 2016 that you support Medicare for All, expanding Social Security, and opposition to the TPP -- and you think they should, too.